It’s hard to believe, but July 30th marked one year of swim classes at Salem! It has been a fabulous year with hundreds of children learning the life-saving skill of swim under the direction of our start-up Swim Director, Mike Wood. Mike has done an AMAZING job of helping take Salem Swim from the drawing board to reality, but it is now time for Mike to return home to Minnesota. 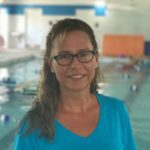 We are pleased to announce Carrie Petersen as the new Salem Swim Director. Carrie is no stranger to Salem – her daughter Sarah was a long time Salem gymnast and Carrie was a very active volunteer, serving as Booster Club President before moving to Boone, NC. While in the mountains, Carrie and her husband Aaron owned the Deer Valley Racquet Club where he taught tennis and she served as General Manager. They recently returned “home” to Winston-Salem and back to Salem Gymnastics & Swim. Carrie is not only a great fit for Salem, but a great asset for our company. Please join us in welcoming her back to the Salem family!